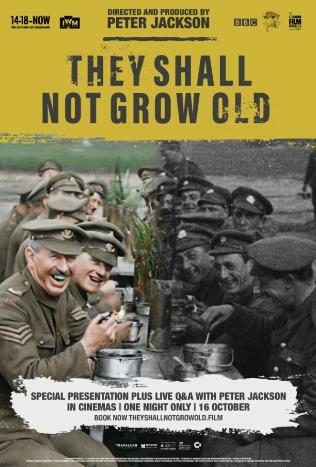 One of the highlights of the closing act of the centenary commemorations of the First World War has been the release and UK-wide distribution (including to all British secondary schools) of Peter Jackson’s personal ‘labour of love’ They Shall Not Grow Old (2018). The director of The Lord of the Rings trilogy has used modern techniques to restore footage from Imperial War Museums’ (IWM) extensive archive, alongside BBC and IWM interviews with veterans of the conflict, to bring First World War soldiers back to life. The launch took place at IWM on 16 October 2018 where Jackson participated in a Q&A session. One of his comments provoked consideration about the relationship between history, empathy and understanding. He argued that professional historians should be left to ‘tell the story of the war’; instead, his role was to regain the humanity of the event, as if to suggest historians were not suitably equipped for that job. Pedagogically, this comment got to the heart of recent discussions that I have had with third-year undergraduate students at the University of Exeter, studying my research-led module ‘The First World War: Interrogating the Myths’. When considering the course of industrialised warfare on the Western Front between 1915 and 1917, we reflect on the place of the so-called ‘learning curve’ in historiography; the process of improvement in the British army based on battlefield experience, from the infamous first day of the Somme to 1918’s victorious series of offensive battles in the ‘Hundred Days’ offensive. We assess the validity of arguments in favour of describing the Somme 1916 as a ‘success’ and the degree to which historians may have to put emotion to one side in order to reach that conclusion. As one student said to me, ‘pragmatically, yes, I can be persuaded that you lose some battles to win the war. But that [over a million total casualties] is a hell of a price to pay. I’m not sure I’m comfortable with that’. We discuss to what extent the historian’s job should be uncomfortable. Pragmatism forces us to face the central reality of waging war: to kill as many of the enemy as possible. Jackson’s delineation also resonated with an ongoing research project I am leading, with Dr Mark Sheehan of Victoria, University of Wellington, which examines the way young people in Britain, Australia, Canada and New Zealand engage with the cultural memory of the two world wars: ‘Teaching and Learning War: Education and Modern Conflict in an International Comparative Perspective’ (2017-2020). Its current configuration, as an Arts and Humanities Research Council (AHRC) networking project, structures the key research questions around a series of events. The latest event – The Empathy Effect – hosted at the Bill Douglas Cinema Museum at the University of Exeter on 12 September 2018 and co-organised with a literary scholar, Dr Ann-Marie Einhaus from Northumbria University, sought to explore the way literary texts are used in teaching about the history and remembrance of the First and Second World Wars, including the Holocaust. Teachers, not only of literature, across the world use literary texts and creative writing exercises to teach about conflict in order to develop the students’ capacity for empathy and help readers see other points of view. But as our discussions revealed, the term empathy, certainly in history education, is fraught with controversy. Panelists discussing the intersections of empathy, literature and violence at The Empathy Effect workshop, University of Exeter, 12 September 2018. Photo courtesy of Steven Haywood Photography. A number of secondary-level history teachers who participated in an earlier AHRC-funded project, ‘The First World War in the Classroom: Teaching and the Construction of Cultural Memory’ (2013-14), led by myself and Ann-Marie Einhaus, looked favourably on creative exercises that helped pupils put themselves ‘in the shoes’ of the individuals and societies they are studying. In fact, the study of the world wars, including the Holocaust, were understood to be the prime curriculum opportunities to instil empathy in their cohorts. In line with broader educational emphasis on the concept of historical empathy, many of the initiatives to engage young people in the history of the First World War during the centenary, most notably the First World War Centenary Battlefield Tours Programme (which is taking two pupils and a teacher from every secondary school in England to the battlefields of the Western Front), specifically enable pupils to develop a personal connection to the war. For others, the emphasis on empathy poses risks to the development of critical thinking. Like the example above, if too much emotional connection is made to an event what capacity is there for objective and rational analysis? Others argue that it distracts pupils from learning ‘the facts’. What potential inaccuracies can be cemented if a pupil’s interaction with a historical moment, such as the Holocaust, is through young fiction like John Boyne’s The Boy in the Striped Pyjamas (2006), rather than historical evidence? What responsibility do authors of children’s literature have to historical accuracy? The assault on empathy has been most vocally played out in the press, where attempts to ‘humanise’ the history of the First World War have led to accusations of over-sentimentalisation and ‘dumbing down’. As Susie Mesure wrote in the Independent in August 2010, she sees history in the UK as being taught through the politically correct ‘liberal’ prism of the National Curriculum, which ‘wants students to emerge able to empathise their way through coursework rather than retain any actual knowledge that might serve them in later life’. The discussions provoked at ‘The Empathy Effect’ highlighted the complex relationship between history, empathy and learning about 20th century conflict and genocide. They also challenge Jackson’s distinction between who ‘can’ and ‘cannot’ tell humanised stories about the past. The centenary alone has witnessed a number of projects, led by historians and non-historians alike – often in collaboration (for example through the AHRC-funded World War One Engagement Centres), that engage young people in the history and memory of the war combining crucial historical context with empathetic skills. Certainly, the teachers I have interacted with over the course of my research have confirmed a desire to mobilise historical empathy as only one aspect of the learning process. They want their pupils to make informed judgements about people in the past based on evidence not uncontrolled flights of the imagination. Yet at the same time we need to be alert to the pitfalls of conflating history and emotion. If, as historians, we want to be able to teach the humanity as well as the facts of war, perhaps the best thing we can do is to make questions of empathy and subjectivity explicit in our teaching. Young people – as the example of my own students shows – are perfectly capable of engaging with the challenge of negotiating multiple aspects of a story. About the Author: Professor Catriona Pennell is Associate Professor of History at the University of Exeter. She is the author of A Kingdom United: Popular Responses to the Outbreak of the First World War in Britain and Ireland (OUP, 2012; 2014) as well as many articles and chapters on history, education and memory. She sits on the Board of Directors of the International Society for First World War Studies and is an inaugural Associate of the Imperial War Museum Institute.